McLaren's technical director Paddy Lowe and the team's director of engineering Tim Goss talk about the new MP4-27 in a joint interview. Both point out that the new exhaust regulations have sealed the fate of the U-pods as the team have reverted to a more conventional sidepod shape. After a successful 2011 season, what were your main aims with the development of the MP4-27? Paddy: “Our main objectives for the 2012 season were to optimise downforce despite the changes to the blown floor, and to improve our understanding and utilisation of the Pirelli tyres, which were new to us last year. What are the key visual differences between the 2011 and 2012 cars? Were there any particular challenges in adapting to the new 2012 regulations? Have there been knock-on effects to the design of the car due to the exhaust restrictions? There have been a few departures from the technical team over the winter – are you comfortable with that? 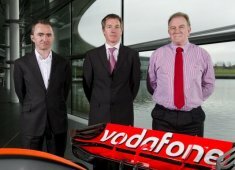 Paddy: “I always say this, but Vodafone McLaren Mercedes is an extremely broad organisation. Bear in mind that we have 200 engineers working here – and, if those people all stayed in their job for 10 years, then we’d lose 20 engineers a year.